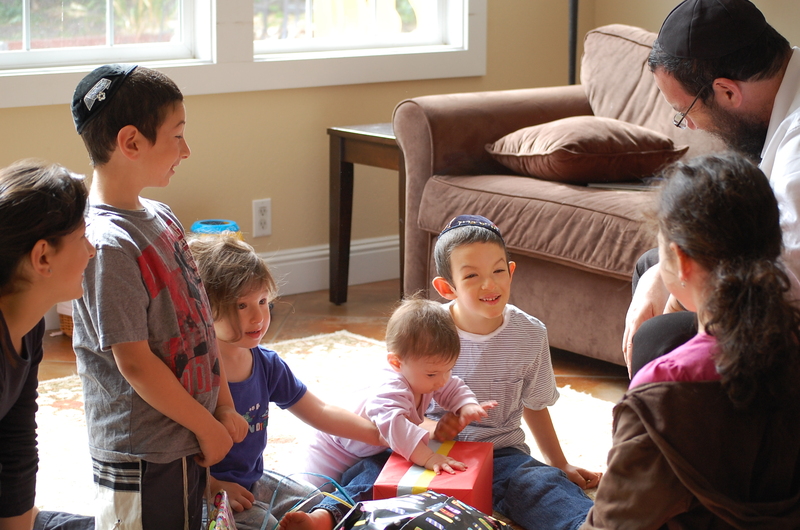 Today is Chaim Boruch’s 5th Birthday! For those of you who don’t know, you will be excited to hear that he is now walking!! It is a miraculous site to see him walk around the house, holding on to furniture for support and then stop to stand and marvel at this new experience. How blessed we are to be part of appreciating life’s ‘little’ things, like walking. Chaim Boruch is also feeling very proud and will show you that he can now do things like open the fridge, the pantry and even the microwave while it’s on! Chaim Boruch is also transitioning into a real bed from his crib and to watch his little face smile as he snuggles up with his blanket, makes your heart sing! Our family really is so fortunate because Chaim Boruch has changed our lives to see things in a most magnificent way. Chaim Boruch has taught us to dream big….really big! He has taught us that when you fall down, you must get up and try again. He has taught us that it’s okay to have a hard day and cry, as long as you find inner strength to go to bed smiling. Chaim Boruch has taught us to feel love and to listen…..really listen. Chaim Boruch has taught us that so much can be said without words. A beautiful world with so many mitzvahs to do…. So take a moment, do a Mitzvah and enjoy it! Take a challenge in your life and defy the odds against you, in body, mind and spirit. It is known that on ones birthday, the power to bless others is tremendous. and may we all merit the coming of Moshiach now! I love you Chaim Boruch.